In light of recent events, Ketchum and Police Chief John Askey said they’ve instructed their people not to disrupt food truck operations. If they do enforce the permit requirements, they said, they’ll simply issue a court appearance ticket and let a judge decide how to handle it. Askey also said he was embarrassed to learn that the “anonymous complaint” lodged with the Building Department against the Lloyd Taco Truck on Monday came from one of his own officers, who has relatives in the restaurant business and called in the complaint as a private citizen. Please tell me which officer, and which restaurant, are implicated by emailing me at buffalopundit[at]gmail.com. I have some questions for them. Joe Illuzzi, owner of the Illuzzi Letter and assorted websites, is dead. For now, I offer you this open thread. Governor Cuomo, First: Do No Harm. Has a penny of the billion-dollar grant been spent yet? Is it in anyone’s account yet? Is there a plan for how it will be spent yet? The reason I ask is because that billion dollar grant that Governor Cuomo announced for Buffalo several months ago sure sounds great, but what’s going on with it? Who from this committee, which is in charge of the money, is communicating with us about what’s going on with it? There’s this PowerPoint from Brookings, and this paper, which is fantastic, but now what? What’s next? Jim Heaney from Investigative Post gave an update where the committee has decided to make a decision, but the whole process isn’t user-friendly, isn’t particularly well-publicized, and has neither the efficiency of a dictatorship nor the legitimacy of a democratic process. And another reason I ask is that Albany inaction has been in the news twice now in recent days. First, this report from the Buffalo News placing the blame on the delay in negotiating a new Bills lease squarely on the Cuomo Administration. The deal doesn’t get done if Albany, the County, and the Bills aren’t at the table, and Albany has been unready or unwilling to move on this. The reasons why? What reason would make sense? Why would Governor Cuomo – who has placed a billion dollar bet on Buffalo – risk losing the only NFL team that plays home games within New York State? There’s no scenario within which that makes any sense. Heaney:The AM&A’s building. It’s next to the Trico Building. It’s probably the biggest hulking vacant space in downtown. You’ve got an option that’s expiring soon with that property. Where do things stand? Termini: Well we’re waiting for the tax credit bill to be signed by Albany. Termini: From 5 to 12 million dollars. Heaney:And you need that much additional to make the project work? Heaney:The project is how much? Heaney:Is this a spec project or do you have tenants? Termini: The building is 100 percent leased by various businesses that we’ve already been in contact with. Heaney:You probably don’t want to name individual tenants, but give me a flavor – is this hotel? Is this retail? Is this office? Is this high-tech office? What’s the tenant mix? Termini: It’s all of them. But a lot of it is tech companies that are looking for what I call “Googlized space” – cool space – which there isn’t any cool space downtown. And we are filling that niche in downtown of providing cool space for tech companies. Heaney:When does your option expire? Termini: In a couple of weeks, and if it’s not signed in a couple of weeks we’ll get a move on to another project because we don’t want to lose our tenants. Heaney:So you’re going to walk away from the building and they’ll be back to ground zero after that? Heaney:Any indication from the governor’s people as to which way he’s leaning at this point? Heaney:How are the local politicians? Are they in support of this? Are they not in support of this? Are they sitting it out? Termini: Every local politician is in support of this project. They all voted for it. They’ve had press conferences about it. They know the importance of this bill to Upstate New York. It’s not just Buffalo, it’s every city along the Thruway, which are faced with the same problems. Heaney:So basically Cuomo signs or you walk. Cuomo didn’t sign. Termini walked. 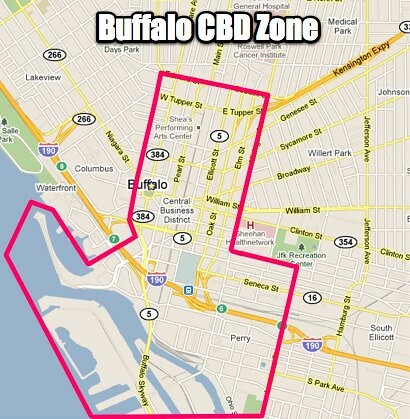 Hey, Albany & Governor Cuomo: Buffalo and WNY are all FUBAR as it is. We don’t need you to make it worse. This is bad politics and bad policy, and there’s no reasonable rationale for this kind of governmental malpractice. Some are saying this has something to do with the chairmanship of the Erie County Democratic Committee. That can’t be right, though, can it? Seriously, you would harm the entire community over Frank Max? That’s not just malpractice, that’s reckless and wanton. During the Democratic National Convention in Charlotte last month, County Executive Mark Poloncarz angered a lot of people when he Tweeted about how much nicer Charlotte’s convention center is, compared to Buffalo’s. Jim Fink ripped Poloncarz in Business First, but now admits he was wrong – he thought Poloncarz was comparing our convention center to the Time Warner Center. There’s absolutely nothing appealing for a casual convention-goer who doesn’t much care about architecture or the realness or authenticity about a place. Our downtown is a disgrace, and the convention center looks like someone took the Sedita City Court building and laid it on its side. The convention center is a brutalist monstrosity that blocks off Genesee Street, resembles a German Normandy bunker, and goes out of its horrible way to make downtown look even uglier and less inviting – less human. It’s not perfect, but it’s not a Stalinist apartment block, either. It’s absolutely time to start talking again about improving downtown – which has been happening slowly, in fits and starts. We need a plan for smart parking and land value taxation to de-incentivize lazy maintenance of our sea of surface parking lots. We also need a new, attractive convention center that can attract business and visitors, and be a showpiece for a new Buffalo. One that’s welcoming. Perhaps we can kill two birds with one stone and demolish the existing convention center, make that land ready for development – on two parcels, re-establishing that stretch of Genesee Street. 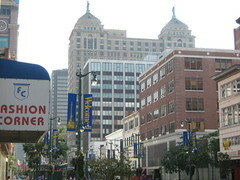 The convention center could be located perhaps on the site of the current Adams Mark, which should also be demolished. Perhaps we could demolish them both on the same day and hold the biggest fricking celebration Buffalo ever had. He notes that a new convention center in Niagara Falls, ON has had a $110 million impact on that city already. So, I’ll revisit my original idea, which has been actually picking up supporters and steam. It was most recently echoed by Rocco Termini in an interview with Investigative Post’s Jim Heaney. Termini: That’s a small segment of what is out there. We need to develop the whole concept of the Toronto market. I’m going to be in Toronto over the weekend talking about this very thing. Heaney: What’s your thought on how to capitalize? Termini: I think what we need to do is form a sales tax free zone downtown. We need to take over the first floor of every building downtown and we need to put in there an outlet mall type, high-end retail. 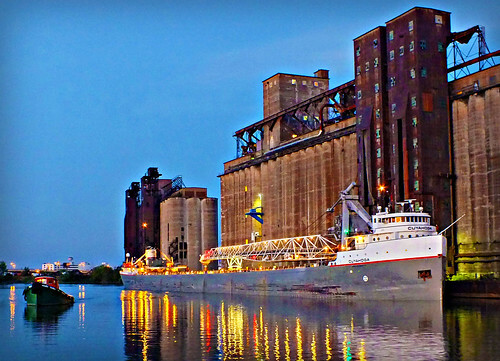 And then you will get people coming into Buffalo from Toronto. And then they’ll go to the restaurants, they’ll stay at the hotels, they’ll make a day of it. I just called for a hotel room in Toronto and Trump Tower is $750 a night. You can come and stay at probably a better room at the Lafayette for $149, so a person from Toronto can come down to Buffalo, have dinner, shop all day, and stay in a hotel here. Heaney: Doesn’t that put local existing merchants at a disadvantage all of a sudden? “I’m selling, the guy downtown is selling; I’ve got to collect a sales tax he doesn’t.” Aren’t you in a stealing from Peter to pay Paul scenario? Termini: Not really. They’re getting a small fraction of the people coming from Canada. And don’t forget, they already have an advantage. They have expressways going right to their malls; they have free parking, something that we’ve paid for as city residents for many years. And now it’s time for the city to get what they deserve and they deserve a chance to get restarted. Nothing else has worked. We talked about so many things to bring retail back to downtown and nothing has worked. I think this will work because people travel to the Indian reservation to save $5 on a carton of cigarettes and they’ll spend $6 worth of gasoline. But when people think they’re getting a deal they will come. The central business district is a wasteland. We’re now talking about creating a new little shopping district at the foot of Main Street out of whole cloth. But even if we build it, how do you ensure that they come, and that it’s sustainable? Just being there for when hockey or lacrosse games get out isn’t enough. Just being there in nice weather isn’t enough. It has to be something people want to come to, and people want to return to.